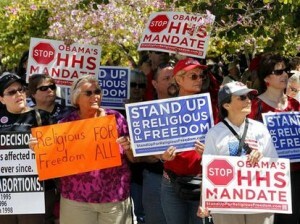 Bishops, Cardinals, and other leaders of Catholic organizations are filing suit against the Obama administration, charging that the President’s health care plan infringes on religious freedom. The plan mandates that all employers cover contraceptive services, such as exams, counseling, and prescriptions for contraceptive products. Roman Catholics oppose the use of non-natural methods of contraception (which they consider tantamount to abortion), so the mandate pits the Church squarely against its own stated principles. The administration has suggested that it will make exceptions for religious organizations, but its definition of such leaves out Catholic schools and universities and Catholic publications. Religious leaders have previously tried to come to an agreement with the White House on this issue, but so far have been unsuccessful in finding a compromise. 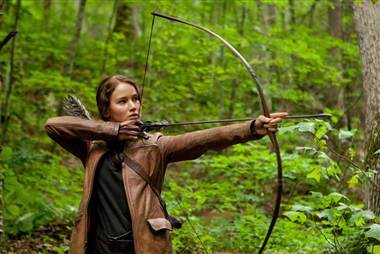 Read more on this issue at Deseret News, The NY Times, or Reuters News Service. You might also want to visit this website, dedicated to the cause. 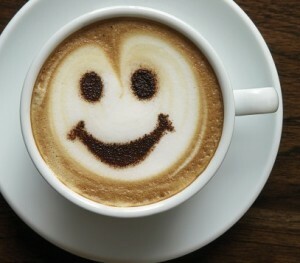 Coffee Can Extend Your Life – Really! In a New England Journal of Medicine study of 400,000 aging Americans, the NIH once again proved that coffee drinking is good for your heart, and a bunch of other organs, too. The study showed it was not about “moderation”, either, as the breakpoint for living a significantly longer lifespan (10%-15% longer) was based on folks having 6 or more cups a day! For more details, read the full article in Time or check out the study itself. 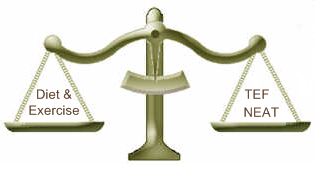 In The Real Bathroom Scales, we verified two important facts. 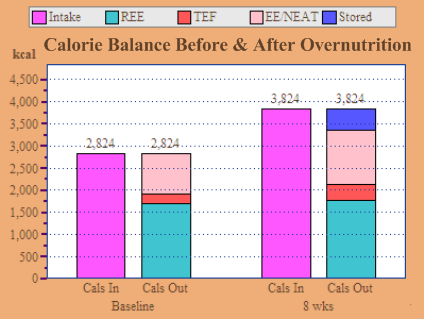 First, we confirmed that the body responds to alterations in calorie balance with a combination of adjustments to energy storage (body mass) and to energy usage, the latter being mostly via changes to TEF and NEAT. Second, we saw that there was a wide variance between individuals in their rate and degree of adaption via the energy expenditure variables. 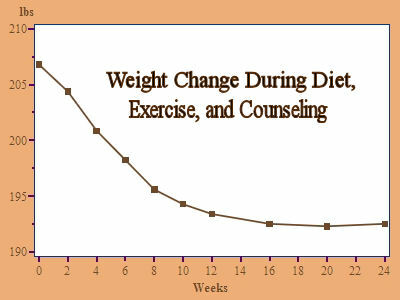 In fact, in the Mayo Clinic NEAT study, the change in expenditure in response to an added 1,000 calories per day ranged from a low of +107 cals to a high of +917 cals, a nine-fold difference!1 So what drives these vast differences in our ability to adapt to changes in intake, such that some of us pile on the pounds, while others never seem to gain an ounce? 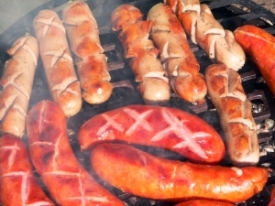 While there are myriad biological abnormalities that can lead to obesity, most of them are uncommon, such as leptin deficiency, adrenal tumors, or genetic diseases such as Prader-Willi Syndrome. Most common obesities, on the other hand, can be directly linked to poor function or signaling of the sympathetic nervous system. The SNS is a primary regulator of many of the body’s homeostatic mechanisms, not the least of which is energy balance. 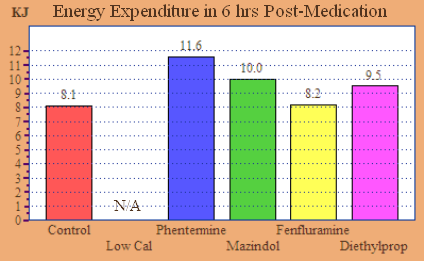 The effects of the SNS on energy balance are achieved through the binding of catecholamines (adrenaline and noradrenaline) to a series of receptors known as the adrenergic receptors. “Greek Alphabet Soup” There are two basic types of adrenergic receptors, the alphas and the betas, and while both play a role in the management of body fat, the beta adrenergic receptors have been much more extensively studied with regard to energy balance, so we’ll start there. There are three beta receptors, and all are involved in the automatic regulation of energy expenditure, with some ability of each to compensate for the others. When these receptors are sufficiently stimulated by endogenous catecholamines or pharmacologic substitutes, the body is relatively resistant to weight gain. 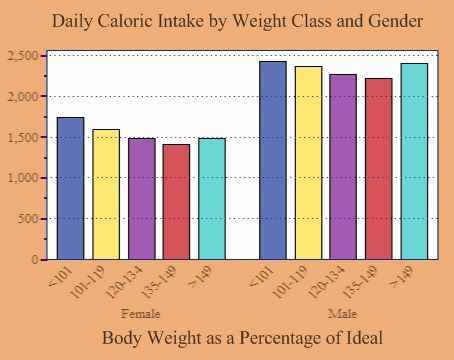 High levels of beta adrenergic stimulation probably underlie the “lean ‘n hungry” phenotype referred to in The Calculus of Calorie Counting. Without that stimulation, eating the same amount of food and doing the same amount of exercise, you will simply burn less of it as heat and energy and store more of it as fat. Like the patient in the Mayo Clinic NEAT study who only increased his energy expenditure by 107 calories per day, you would have what researchers call “defective thermogenesis”. 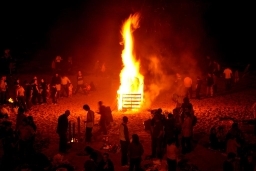 Although the concept of thermogenesis has been around for at least half a century, the definitive proof that the beta-adrenergic receptors mediate thermogenesis took some time to develop. 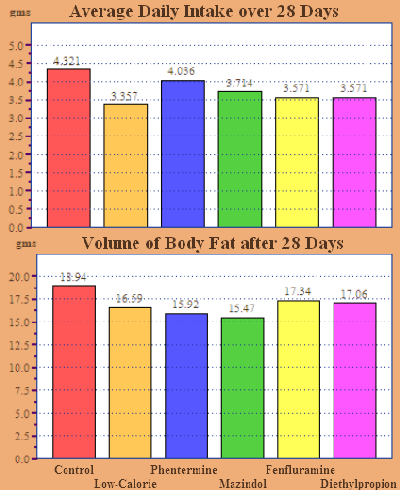 Adapted from “beta-AR Signaling Required for Diet-Induced Thermogenesis and Obesity Resistance” by Bachman, E.S., et. al. Science, August 2, 2002; 297(5582): 843 – 845. In a revealing study of mice specially bred to lack all three beta receptors, researchers at Harvard Medical School showed how profoundly the beta receptors effect our ability to dispense with our caloric intake. 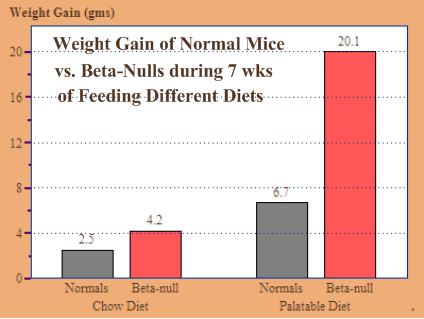 In two separate experiments, these beta-null mice were compared with normals under free-feeding situations with first, ordinary lab chow, and second, with more palatable high-fat chow. 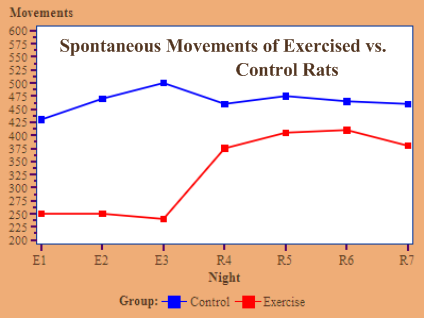 All the mice consumed more calories with the more palatable chow, however, in both situations, beta-nulls ate exactly the same amount as normal mice and engaged in similar amounts of activity. The difference in the outcomes, however, was startling. 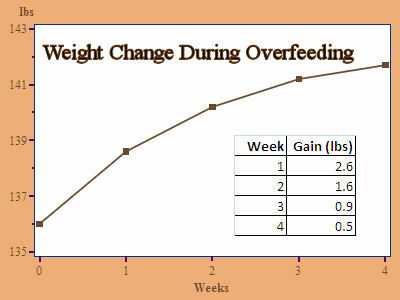 The beta-nulls had consistently lower energy expenditure, and as the graph shows, consistently higher weight gain; on lab chow, it was about 70% higher, and on the palatable diet, it was three times higher! Now, while the beta adrenergic receptors are clearly important to fat-burning, the alpha adrenergics should not be ignored. The alpha adrenergics are often described as being anti-lipolytic, because the alpha-2 adrenoreceptors reduce levels of cyclic adenosine monophosphate, an important second messenger in the thermogenic process. This characterization is somewhat lopsided, however, as the alpha-2’s also have a generally inhibitory effect on the pituitary hormones, putting the brakes on excessive levels of insulin, prolactin, cortisol2, and thyroid. These are not hormones that we necessarily want to inhibit, but neither do we benefit from excess; all of these hormones have optimal levels, and too much is just as problematic as too little. With regard to controlling our weight, we particularly need to keep our levels of insulin in check. 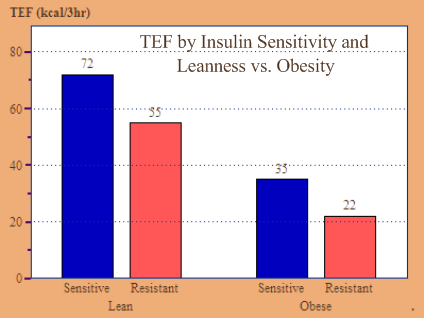 “Insulination” Recall from Dr. Segal’s research in Calculus, how the presence of insulin resistance dramatically reduces the thermic effect of feeding (TEF), in both the lean and the obese.3 Besides just impacting TEF, however, insulin reduces the overall fat-burning ability of the body. In fact, insulin reduces the effect of beta-adrenergic stimulation in a dose-dependent manner; in one study, the calorigenic effect of norepinephrine was decreased by the presence of elevated insulin levels by as much as 50%.4 Just how powerfully does insulin sensitivity impact our ability to burn fat? Consider this interesting study: a group of researchers in Canada bred a strain of mice with a mutation in their insulin receptors, such that the same amount of insulin would keep the receptor active longer, thereby reducing the amount of insulin needed to return blood sugar to basal levels. In other words, these mutant mice were exquisitely insulin-sensitive. The researchers then placed the mutants and a control group of wild-type mice on a high-calorie diet designed to cause weight gain. 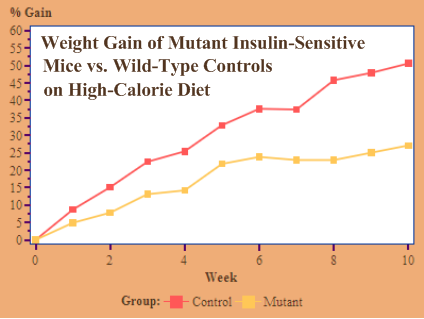 While on the diet, the mutant mice maintained slightly lower blood glucose levels, despite secreting approximately half the amount of insulin as the controls. 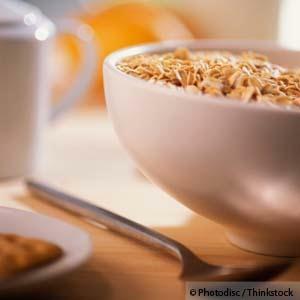 Because of the reduction in insulin, weight gain was significantly lower, too. 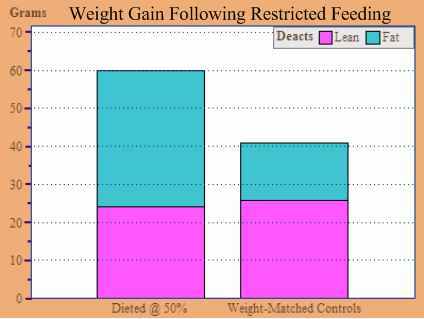 After 10 weeks on the diet, the mutants had added 27% to their weight, while the wild-types gained 50%–all while eating and exercising in a similar fashion. 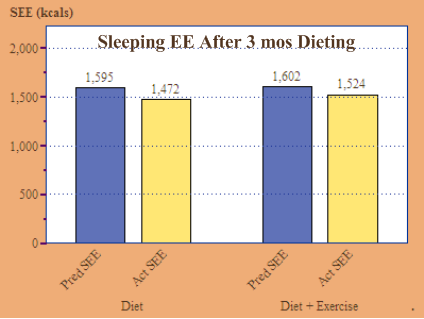 So here we have two common physiologic aberrations–insulin resistance and decreased adrenergc stimulation–that lead to decreased energy expenditure without any difference in diet or exercise patterns. For those who have any degree of either or both of these conditions, fat will tend to accumulate easily and be difficult to lose, while those on the other end of the spectrum, our (annoying) “lean ‘n hungry” friends, can’t gain weight to save their lives. Now, the important thing is, is there anything we can do about this? Well, it just so happens there is. If nature left a little something out of your gene pool, you can get it back. 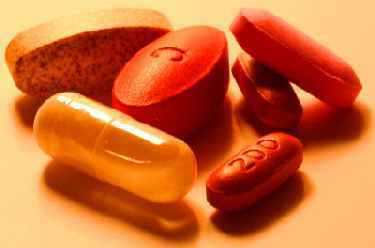 In my next post, You Can Get There From Here, I’ll start showing you which products, both prescription and OTC, can truly change your metabolism.